This week in Cover Story we take a look at some of the game changing events in this ever so stormy monsoon parliamentary session. We get you a roundup of all the political events of this monsoon session. It is called The Monsoon Churn as the season and the action inside and outside parliament has been nothing less than a movie sequence. 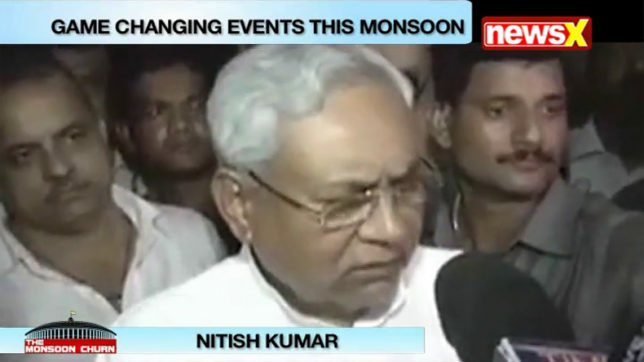 Nitish Kumar’s defection from the secular camp, the election of a new President and a high-profile Rajya Sabha polls on the anvil. It seems like the political narrative has suddenly shifted away from the politics of secular vs communal to those who are against corruption vs the ones who are ally with the tainted. So, this week in Cover Story we speak to analysts and find out about the stormy monsoon session. The show is anchored by Priya Sahgal, Senior Executive Editor of NewsX. Catch more of such Cover Story episodes on NewsX/NewsXHD every weekend on Saturday at 8:25PM and for a repeat show on Sunday at 9:25AM & 6:25PM.